RSVP & WIN fantastic prizes, grab creative ideas, tips and advice from the bridal experts at the show. Following our revamp in June, we are proud and excited to showcase our new issue, along with our Fabulous Weddings show this July. What to expect: a variety of the loveliest wedding and evening gowns from bridal exhibitors, hard-to-resist packages and perks from venues, and fun fringe activities including sessions with fengshui experts, Renaye & Paul Consultancy Group. If you're sussing out auspicious dates to tie the knot, or seeking advice in general, book your appointment at renaenpaul2001@gmail.com or message them on Facebook to get complimentary readings from Renaye & Paul Consultancy Group. Each session lasts 10 to 15 minutes, and the booth will be open on Saturday and Sunday (July 11 & 12), from 11am to 7pm. Enjoy up to 20 per cent off when you sign up with Ektory's packages during our show. The brand offers bespoke flower backdrops and prop rentals for weddings, and we know you won't want to miss their offerings. Can't wait? 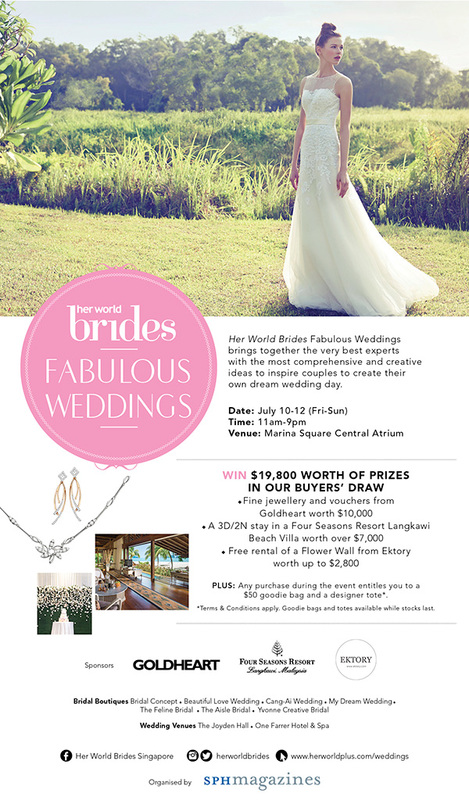 RSVP your attendance with us by filling in the form below, to receive a goodie bag worth $50, and a complimentary digital issue of Her World Brides' June - August 2015. Event:1. One registration per couple, repeat entries not allowed.2. Collection must be done in person and valid ID must be presented. 3. Goodie bags available for the 1st 300 couples, while stock last.